Brymbo was a facinating railway location, seemingly ignored by railway photographers - including me. Yet it was the only place in Wales served by 3 of the 'big-four' railway companies, and even in the 1970's it had 3 signal boxes, steep gradients, 7 return freight trains a day, and gravity shunting. The freight traffic came from the steelworks, situated in the centre of the village, portions of which the works continued to engulf every time it was expanded. 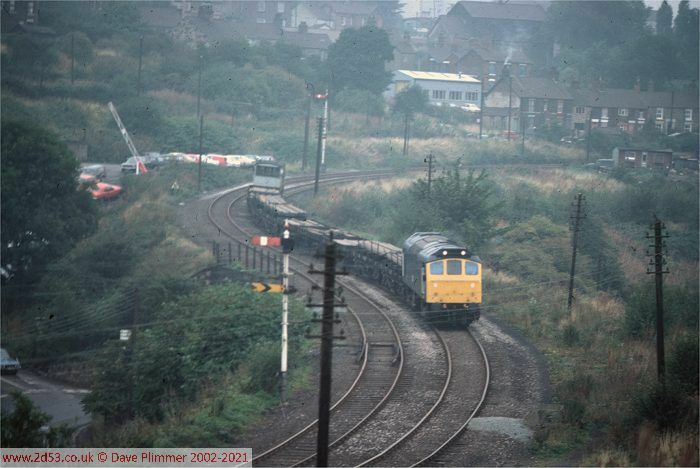 Rail traffic ceased in October 1982, and the steelworks closed in September 1990. 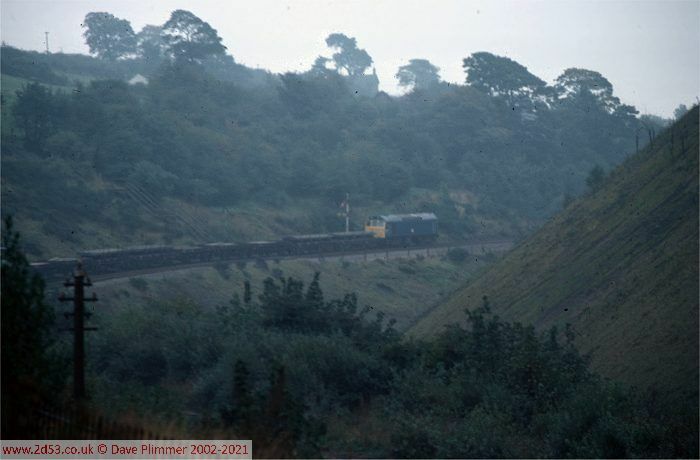 On 27th September 1977, 25165 heads down the bank from Brymbo Middle with 9T80 carrying steel from Brymbo steelworks. This train first headed from top left of the picture (where the steelworks was located) down the works branch to Brymbo Middle signal box (out of sight upper mid-right). Regulations allowed trains of under 15 wagons to be gravity shunted there, which allowed a quick reversal and avoided the need for the loco to run to Brymbo West GF to run round. After reversing, the train, as seen here, crosses the valley towards Brymbo West signalbox as it returns to Croes Newydd Yard. In 1977, there were 7 weekday trips up to Brymbo along the double tracked branch, and 6 on Saturday mornings. The parked cars on the left of the picture are on the site of the old Goods Yard, and the line of green bushes on the centre-right of the picture mark the course of the LNWR branch to Mold, which left the GWR line at the bottom of this picture, ran parallel to it across the road bridge and then diverged to the right. As the train continues down the valley, it hugs the steep hillside. To the right, the valley is filled with the huge mountain of slag, upon which stood the steelworks. Just visible in the bottom centre of the picture are the remains of one of the two platforms of Brymbo station. This was the GWR station on the Wrexham to Minera line, but also used by LMS trains from Mold. Out of sight to the left was the site of the tunnel of the original line to Brymbo from Wheatsheaf Jcn on the Chester to Wrexham line. This line took a direct route, but required 2 inclined planes and was closed when the easier route from Croes Newydd opened.